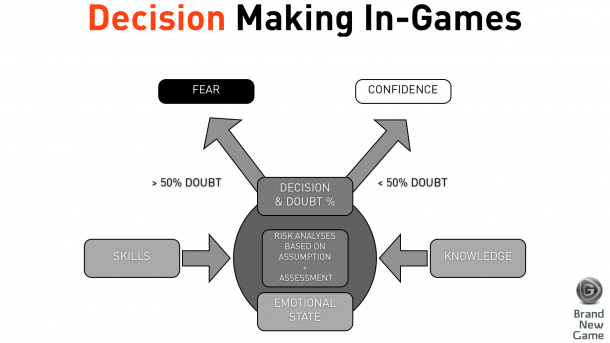 I am working on some models for my new book: Playing on the Job… any comments on this model about decision making in games (and potentially in life…?). It describes how we make decisions in games. I expect we have three basic inputs: (1) Knowledge, (2) Skills which form (3) an Emotional state. Maybe ‘experience’ is another dimension? Or is that embedded in your ‘level of skills’ and ‘knowledge’…? SHARE THE MODEL AND SHARE YOUR THOUGHTS!